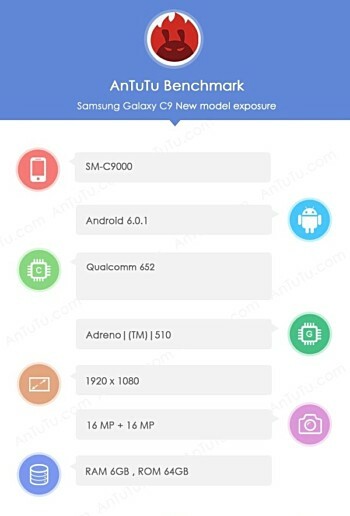 Samsung Galaxy C9 has been spotted on AnTuTu as well, with the listing revealing full HD display, 64GB storage, 16MP rear camera, and 16MP front shooter. Other specs, including Snpadragon 652 SoC, 6GB RAM, and Android 6.0.1 were revealed by the phone’s Geekbench listing as well. 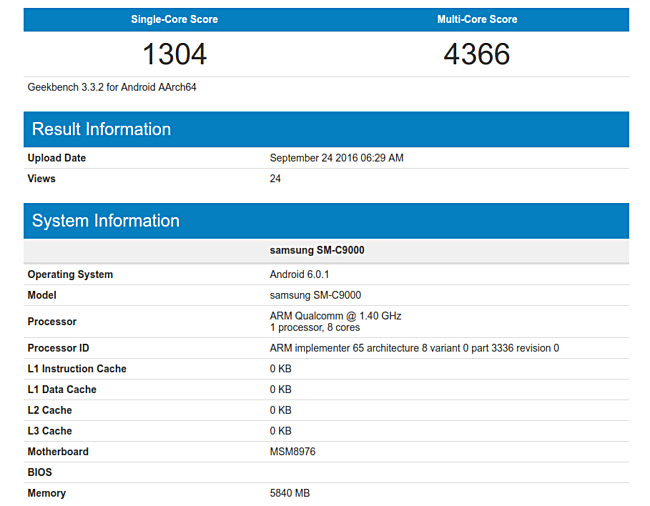 The Samsung Galaxy C9 has now appeared on Geekbench, revealing some of its key specs. The listing reveals that the device is powered by Snapdragon 652 chipset, has 6GB RAM, and is powered by Android 6.0.1 Marshmallow. In case you missed, the phone has been twice spotted on India’s import/export tracking website Zauba so far, revealing a 5.7-inch display on one occasion, and a screen size of 6.0-inch on the other. Rumors say the handset will be launched in the in Oct-Nov time frame.